THE MADNESS HAS OFFICIALLY STARTED! Home/All/THE MADNESS HAS OFFICIALLY STARTED! 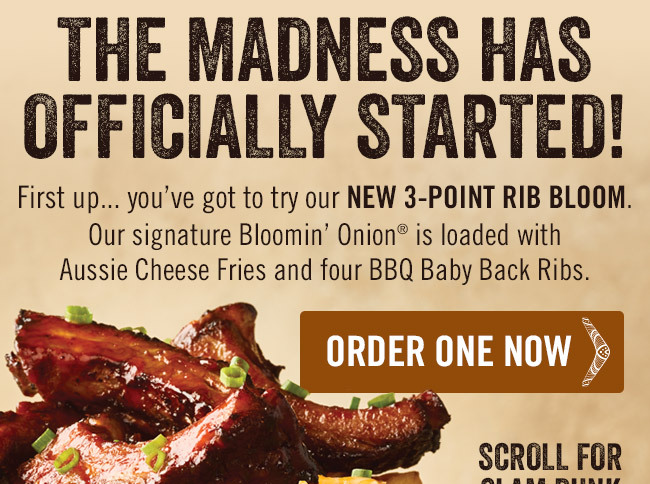 Score our New 3-Point Rib Bloom and some special savings this weekend. *$5 OFF WITH THE PURCHASE OF 2 ADULT DINNER ENTRÉES THROUGH 3/18/2018. Valid at Dinner only (Dine-In or Curbside Take-Away) at participating Outback Steakhouse locations in the US. Get $5 off your check with the purchase of two adult dinner entrées or $2.50 off with the purchase of one adult dinner entrée with show of coupon (not valid for lunch). Use code: MADNESS5 for online ordering. One coupon per table, per visit. Not valid with any other offer, discount, or certificate including any Dine Rewards™ redemption, AARP® Membership Discount, Bloomin’ Monday® or Walkabout Wednesday.. Coupon is not valid after valid date. No cash value. Void where prohibited by law. Prices, product participation and restaurant hours may vary by location. EXPIRES 3/18/2018. *$4 OFF WITH THE PURCHASE OF 2 ADULT LUNCH ENTRÉES THROUGH 3/18/2018. 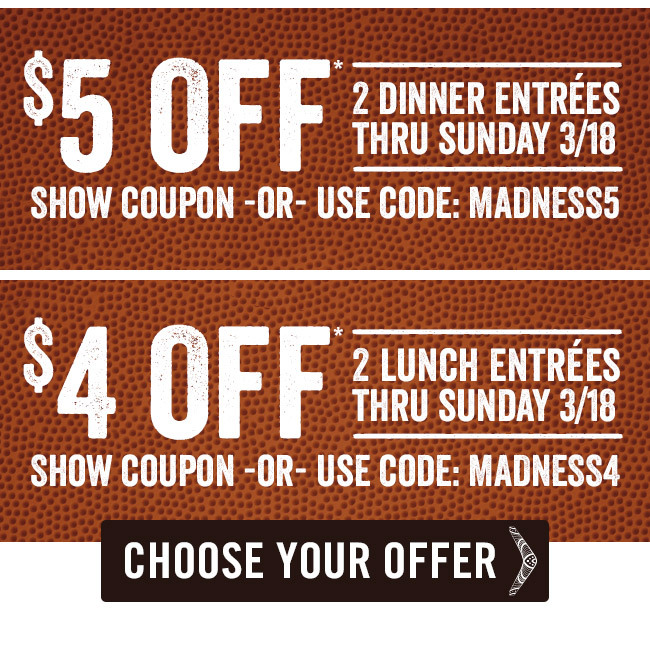 Valid at Lunch only (Dine-In or Curbside Take-Away) at participating Outback Steakhouse locations in the US. Get $4 off your check with the purchase of two adult lunch entrées or $2 off with the purchase of one adult lunch entrée with show of coupon (not valid for dinner). Use code: MADNESS4 for online ordering. One coupon per table, per visit. Not valid with any other offer, discount, or certificate including any Dine Rewards™ redemption, AARP® Membership Discount, Bloomin’ Monday® or Walkabout Wednesday.. Coupon is not valid after valid date. No cash value. Void where prohibited by law. Prices, product participation and restaurant hours may vary by location. EXPIRES 3/18/2018. By Buddy|2018-03-15T06:39:09-04:00March 15th, 2018|All|Comments Off on THE MADNESS HAS OFFICIALLY STARTED!